Le Samouraï. Melville, Jean-Pierre. [Irvington, N.Y.] : Criterion Collection, c2005. Sparse, monochromatic, grey sits the one room Parisian apartment. This is the apartment of Jef Costello, a ritualistic, solitary hit man. Jean-Pierre Melville’s minimalist film noir Le Samouraï, is an exercise in visual storytelling. The characters actions carry the narrative. Dialog is used sparingly. It’s a world of trench coats, piano bars, car thieves, double-cross and deceit. Melville’s focus centers on Costello, an unrelenting monolith of coolness no matter the situation. Despite the dizzying array of bad guys and cops out to take him down, Costello moves forward with calm efficient grace to carry out the current task hand. 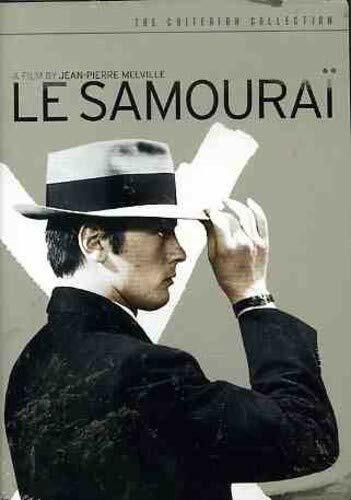 So if you enjoy noir, French New Wave, or stylish visual story telling, be sure add Le Samouraï to your list of must see movies. The two-ID policy runs from Sunday, April 18 to Friday, May 7. All of the rooms switch over to group-use only. A group is considered two or more people (up to six in most rooms). At least two members of the study group must be physically present at the Learning Commons desk to check out a room. We will ask two members of your group to leave their Loyola IDs to check out the room. Anyone with more than $5 in fines will have to pay the fine before checking out a room. Because these rooms are in such high demand, the rooms cannot be renewed. Please don’t switch around IDs, it’s not fair, really, it’s not nice. No reservations. Rooms are first come, first serve. Security is important: Make sure the room is locked when you leave, do not leave your valuables unattended. Watch your stuff! To our students who like quiet and enjoy using the study rooms during the regular semester: There are hundreds of seats in the Monroe Library waiting for you. The second and third floors are designated Quiet Study Areas. If someone is disturbing the peace or making a ruckus, let us know at the Learning Commons desk, we will ask individuals to be quiet, we will ask individuals to leave too. For more information about the group study rooms, configuration, and loan period and overdue fines, go here. More on extended study time in the Monroe Library to come. Clowes, Daniel. Ghost World. Seattle, WA: Fantagraphics Books, 2007. Call number: PN6727 .C565 G46 2007. The graphic novel Ghost World follows the lives of cynical teenagers Enid and Rebecca in the formative summer after their high school graduation. The two bullheaded teens plan to escape the wrath of their overbearing parents by getting jobs and renting an apartment together. The story revolves around a prank Enid and Rebecca play on a quirky older man named Seymour who eventually befriends Enid, changing the course of the girls’ friendship. As the summer unfolds and Enid’s relationship with Seymour develops, the girls begin to grow apart. Will Enid and Rebecca’s plan pan out, or will their diverging paths pull the girls further apart? If you were the type of teenager who hated the jocks and cheerleaders, this graphic novel is for you. Attention Loyola students: extended study hours begin Sunday, April 25 and end Friday, May 7. You are currently browsing the Library Lagniappe blog archives for April, 2010.